As we mentioned yesterday, EURUSD will be affected by the Yellen’s speech and now it has already been influenced and pushed the price in high levels. On the other hand USD could not be supported by the consumer confidence data in US. 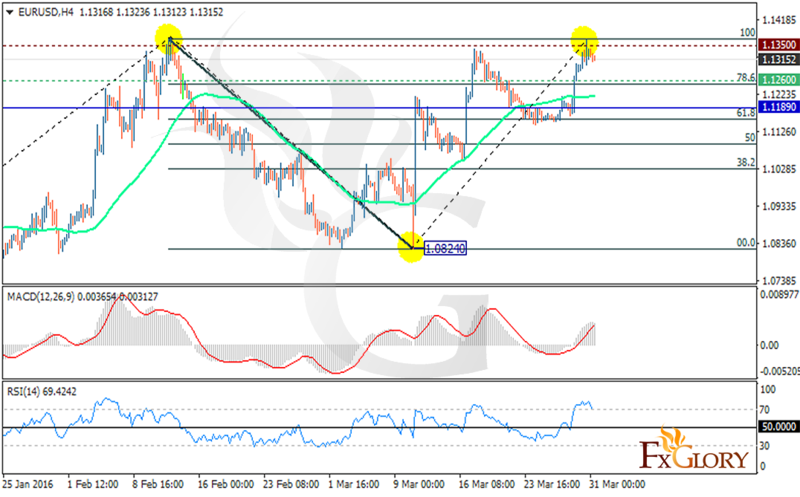 The price growth to 1.1350 confirms the rebound from the 10th of March low at 1.8240. The pair is finding support at 1.1260 close to the Fibonacci retracement at 78.6 with resistance at 1.1350 and is moving above the weekly pivot point at 1.1189. The MACD indicator is showing the price growth since it is in positive territory and also the RSI is above the 50 level. The pair is trying to break the resistance level at 1.1350. Buyers can target 1.1450 at the moment.